Uncomplicated Firewall is a front-end to iptables. Its main goal is to make managing your firewall simple and to provide an easy-to-use interface. Define some default rules for allowing and denying connections. 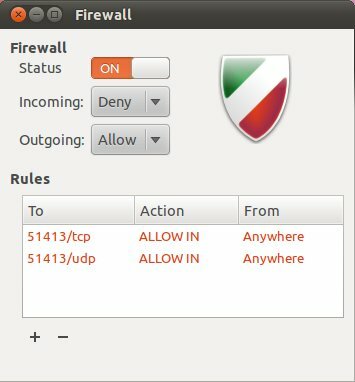 UFW’s defaults are to deny all incoming connections and allow all outgoing connections. The syntax is pretty simple. UFW comes with some defaults for common uses. Our SSH command above is one example. It’s not very common (and even not recomennded) to allow all incoming traffic and then deny something, but it’s good to know how to deny rules. It’s simple, just add delete before the rule implementation. Log levels can be set by running sudo ufw logging low|medium|high, selecting either low, medium, or high from the list. The default setting is low.